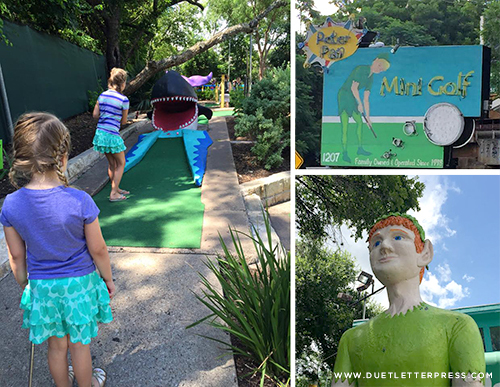 This weekend while friends were in town, we were able to scratch Peter Pan Mini Golf off of our Ultimate Austin List. It was great! A nice + shady spot for an early morning activity great for both kids and grownups. I loved spotting the iconic Austin sculptures like the Pennybacker Bridge. It gets a thumbs up from us! This entry was posted on Tuesday, June 16th, 2015 at 8:53 pm	and is filed under austin. You can follow any responses to this entry through the RSS 2.0 feed. You can leave a response, or trackback from your own site.